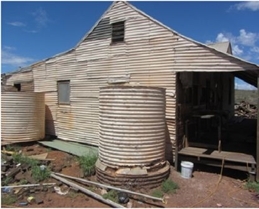 In 2011, the Shire of Leonora was successful in obtaining a Federal Government T-Qual grant for assistance with major conservation works to Patroni’s Guest Home. 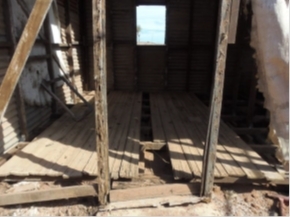 The project enables the restoration of the last remaining boarding house in Gwalia, an integral part of the Gwalia ghost town experience. Although known as Patroni’s Guest Home, this guest house was first owned by Guiseppe Capaelli and then Mrs Ryan. It was taken over by Dina Patroni in 1929. It is believed to have been built c 1920. 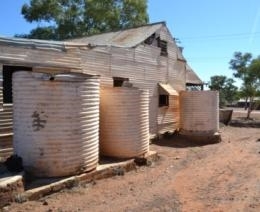 Patroni's Guest Home catered for single miners working at the nearby Sons of Gwalia Mine. Mrs Patroni provided board and lodging. Men could also get casual beds and meals at a low cost. Many of the men were Italian and Yugolsav immigrants, earning Patroni's the nickname 'the migrant's hostel'. The main building was Mrs Patroni's private domain. It contained the family dining room and Mrs Patroni’s bedroom at the front, with a large kitchen, food preparation area and washing up room behind. Boarders were not allowed in this part of the house. The large dining room had a separate side entrance through which boarders and causal diners entered for their meals. The room could accommodate about 28 diners at each sitting, with 6 to 8 men at each bench type table. There was also a crib room where Mrs Patroni's workers prepared packed lunches for the miners. Boarders camped in the small rooms out the back. There was accommodation for about 40 boarders, with two camp beds and a little furniture in each room. The central courtyard area was often a hive of social activity, particularly on Sundays when the men passed the time playing two up or music. After Sons of Gwalia Mine built accommodation and a mess room for single workers in the late 1950s, the boarding houses at Gwalia closed down. Mrs Patroni’s was one of the last in operation at this time. In 1997, the land on which Patroni's Guest Home stands (Lots 514 and 515) were gazetted as Reserve 35047 for the preservation of historical buildings. 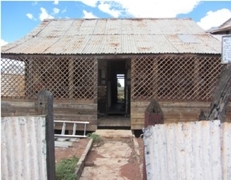 Patroni's Guest Home is believed to be the only remaining purpose built boarding house in the Eastern Goldfields. T-Qual Grants is a competitive grants program aimed at stimulating sustainable economic growth in the Australian tourism industry. The program aims to increase Australia’s supply of quality tourism products and experiences. The competitive grant program is administered by the Department of Resources, Energy and Tourism and offers grants of between $15,000 to $100,000 for each project based on matched $ for $ funding by the applicant. 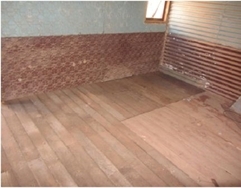 Patroni’s Guest Home was one of 117 projects funded by the T-Qual Grant program in 2011. For further information, visit http://www.ret.gov.au/tourism/business/tq/tgrants/Pages/default.aspx. 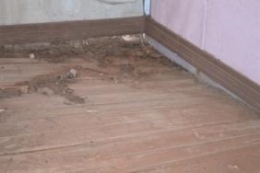 Despite various conservation campaigns over the years, by 2011 Patroni’s Guest Home was generally in very poor condition. 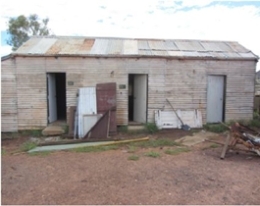 The Shire of Leonora determined that such an iconic building was worthy of conservation for future generations and to improve the visitor experience at Gwalia. The Shire was successful in getting the maximum grant available under the T-Qual program - $100,000. The Shire has funded the remainder of the project ($300,000) from its own funds. The aim of the project is to make the buildings secure and structurally sound, retaining as much of the original materials as possible. It is not intended to make them look like new and only second hand materials are used where replacement material is required. Throughout the project, a cautious approach of changing as much as necessary but as little as possible has been taken. Reinstatement of pressed tin dados and hessian linings to the rooms. Once the conservation project is completed, Patroni’s Guest Home will be fitted out and furnished as it was in the 1950s prior to its closure. 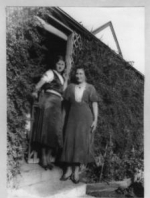 Oral histories compiled as part of the “Mining the Past: Uncovering Gwalia and Leonora” project funded by the Australian Research Council have been a valuable resource in researching how the Guest Home was used and furnished. This information has been compiled and supplemented through another grant project on the interpretation of Gwalia Townsite, funded by Lotterywest. The larger rooms in the main building will be suitable for low key community functions or exhibitions. 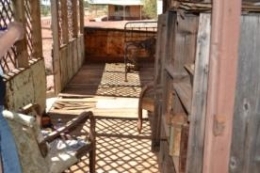 It is intended that the camps be used for overnight accommodation for special events, giving visitors the unique experience of living as single miners did in the first half of the twentieth century.